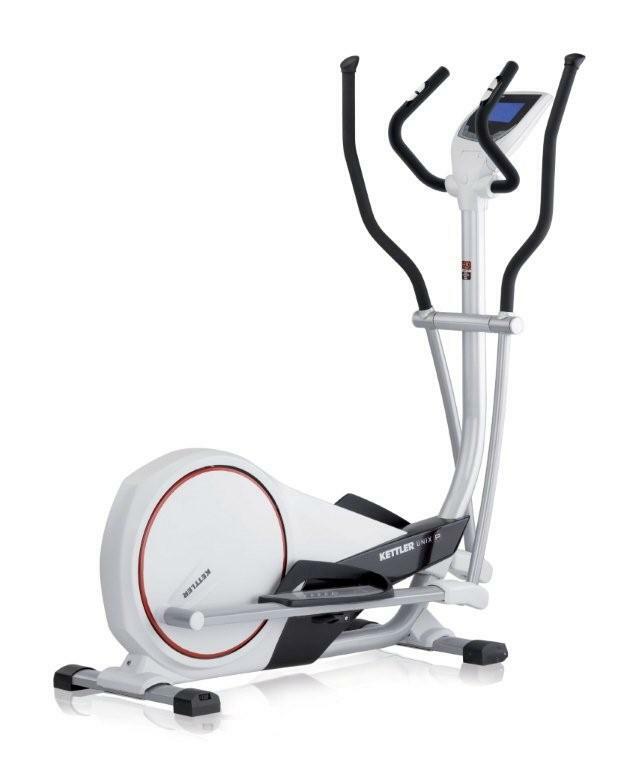 Kettler UNIX P Elliptical Cross Trainer 7652-000 is the latest addition to the Kettler elliptical cross trainer range. All Kettler machines are German designed and built ensuring that you get a high quality machine every time. This latest addition features magnetic brake system, a 16" stride length, 20kg flywheel for a smooth workout and 10 training programmes, including heart rate control. Order your Kettler UNIX P Elliptical Cross Trainer 7652-000 from FitnessZone.com today! The Kettler UNIX P Elliptical Trainer 7652-000 is the top-of-the-line model in the UNIX range and features computer-controlled resistance as well as a sophisticated computer that features 2 Heart Rate Control programs that automatically adjust resistance levels so you can maintain your target heart rate training zone. The feedback from the large computer console includes Speed, RPM, Distance, Time, Energy Consumption, Pulse Rate and Resistance Brake Level as well as a clear, dot-matrix that graphically displays hill profiles. The machine can take a maximum user weight of 330 lbs and the cockpit of the UNIX P elliptical is adjustable. The console tilts and the footplates have 3 adjustments, so just about any user height can be accommodated. In addition to the Kettler UNIX P Elliptical Cross Trainer 7652-000 remarkably stylish design, the Kettler Unix P elliptical trainer features an informative, back-lit, LCD computer display loaded with preset programs that automatically adjust resistance levels based on the graphic hill profile selected. The advanced computer offers heart-rate control programming which adjusts resistance levels depending on pulse rate readings yielding the most effective and efficient workouts. The massive flywheel and drive system creates plenty of inertia to provide incredibly smooth performance. The proven, non-friction, magnetic brake system offers enough challenge to satisfy any level of user. The contemporary design and keen German craftsmanship places the Unix P elliptical trainer as the leader in its class. The Kettler UNIX P Elliptical Cross Trainer 7652-000 offers attractive styling combined with loads of features with an affordable price making it an exceptional value. The heavyweight drive system operates quietly and yields smooth performance while the advanced computer with back-lit blue display provides excellent selection of varied hill profile programs as well as heart-rate-controlled programs. The motorized magnetic braking system offers 16 levels of challenging yet smooth and fluid resistance. The compact footprint helps to save on space. The recovery feature provides a grading of one's cardio wellness showing improvement over time. With all these great features, the Unix P is certainly the best value in the elliptical trainer category. The Kettler UNIX P Elliptical Cross Trainer 7652-000 is designed and built in Germany. The build quality is second to none and the manufacturer backs it up with a 3 year warranty. Order your Kettler UNIX P Elliptical Cross Trainer 7652-000 from FitnessZone.com today!